This cover is made out of heavy aubergine purple chenille with rich gold brocade design woven in. The design may appear silver but it is black. It only looks grey in the sun. The fabric doesn't stretch, fade or shrink. 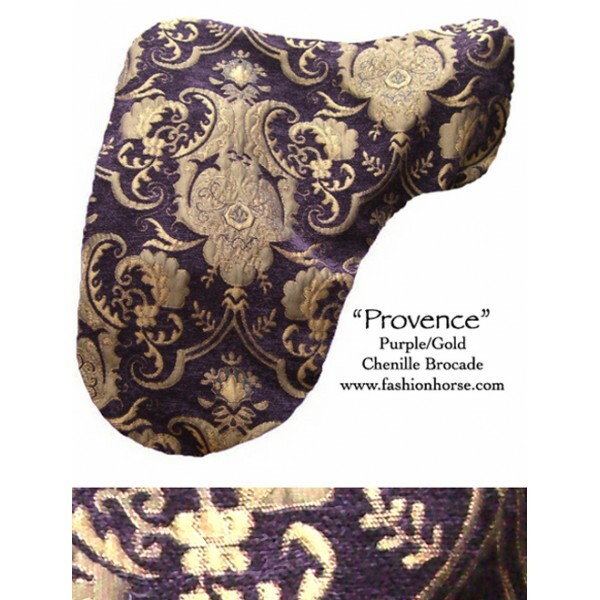 It features our popular "Baroque Piaffe" fabric. The cover is overlocked all the way around and has a quality elastic cord inserted into a channel all around the cover. This cover is generously cut and sized to fit on all dressage saddles up to 18". The cover measures 28" along the top and 29" from the middle seam down the side along the flap. It will work on close contact and general purpose saddles but will be too loose on child saddles.